The 2008 financial crisis delivered a TKO to the global economy. Since then, the media has been reassuring us that the US economy is recovering. Unfortunately, it has been the weakest post-recession recovery in modern history. Some people have seen no recovery whatsoever, and most Americans are losing ground and hope. Why have so many people been so wrong? It was reasonable to assume things were going to get better; that’s how business cycles always played out in the past. Historic patterns tricked many into thinking that the typical recovery would follow. Historical patterns, however, have changed. Forever. And that is due to the biggest macroeconomic event in modern history. Contrary to popular belief, population growth has started to decline. From now on, every subsequent generation will be smaller. Fertility rates in the West are already well below replacement rates, and the rest of the world is quickly catching up. New data show that the US birth rate is at historic lows, certainly in response to economic weakness. People have always delayed childbirth in uncertain economic times. We’re seeing this today at unprecedented levels. Our current fertility rate is barely over 1.8 children per woman. We need at least 2.1 children per woman to keep a steady growth in population and maintain economic stability. 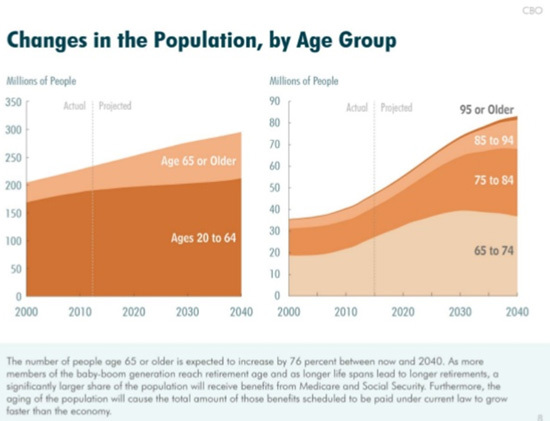 The impact of this demographic shift is immeasurable—except in the broadest of terms. Unfortunately, almost no one with influence or authority seems to grasp this change. Most people, therefore, assume that all the age-old patterns are still in place. I think the Obama administration was so convinced that the economy would fully recover on its own, it didn’t pay attention to the issue. This ignorance was a major mistake because demographics have fundamentally altered the dynamics of economic growth. As the population ages, so do the costs associated with chronic age-related disease. In the past, one generation could run up a bill and send it to a much larger future generation. Due to its size, the future generation could pay off this debt without excessive pain. That’s no longer the case. Even though today’s generation is diminishing, it will still have to bear the burden of a much larger past generation. The social welfare model has been turned on its head, and we’re already seeing the consequences. 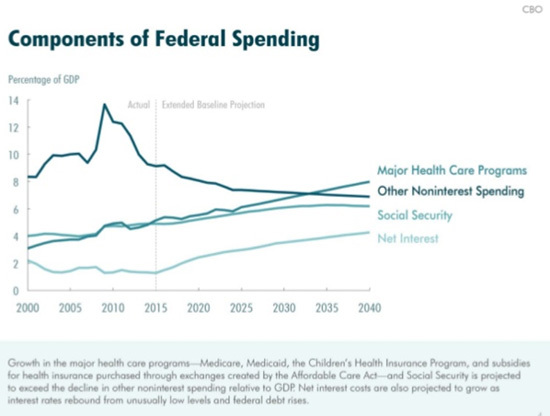 Here are a few charts that prove my point and show how age-related diseases are driving our deficit and debt (be sure to read the CBO’s explanatory text). First, let’s look at the rundown on the federal spending components. Spending is going down or stable as a percentage of GDP in all areas except major healthcare programs and the debt service. Even Social Security spending has leveled out. This is bad, but… you ain’t seen nothin’ yet. 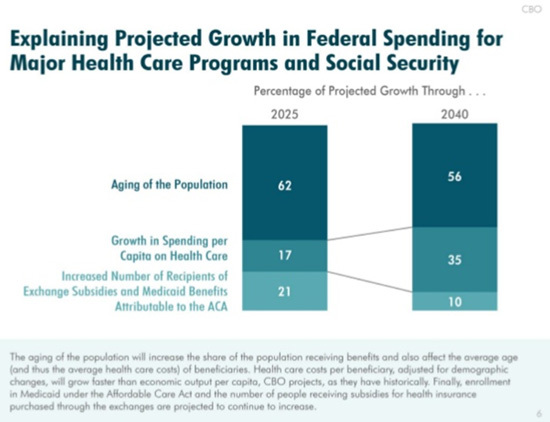 Here’s the CBO’s long-term projection of changes in population by age group. This is what doom looks like in a graph. Now, let’s look at the projected growth in federal spending caused by these demographics. Who is going to bear this burden? That’s right: young people. Sending our medical bills to our children is, to me, the greatest outrage of this preventable financial catastrophe. The Affordable Care Act is already forcing young people to pay insurance costs three times higher than they should. The whole point of the ACA was, in fact, to get poorer young people to pay healthcare costs for richer older people. The ACA has failed, however, to enroll enough young healthy poorer people to make the program liquid in the long term. We’ve reached some sort of tipping point. The rise in public spending and debt has caused the current economic malaise. However, the costs associated with a growing older generation are what drives it. So, we have a vicious circle. All of this is slowing economic growth, and as a result, depresses birth rates among the young who are expected to pay those costs. With fewer contributors/workers to pay escalating age-related healthcare costs, the problem will continue to spiral out of control… unless we allow biotech the freedom to address aging itself. The latest biotech breakthroughs could already reduce medical costs by delaying aging and the onset of chronic and costly diseases. It’s the only solution to the skyrocketing medical costs projected by the CBO. The other half of the solution is for older people to use their extended and restored health to remain productive longer, fixing the old-age dependency ratio (OADR) from both sides of the balance sheet. It will happen. The only question is this: how much pain we will have to suffer before politicians and policy makers wake up and deal with the biggest issue of our time?